Two people have been killed and nine injured when a helicopter crashed into a crane in central London in misty conditions. 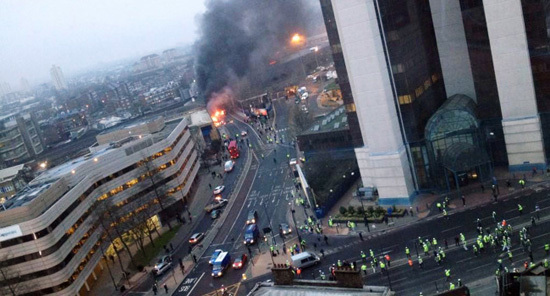 Police said it appeared the helicopter had hit the crane on top of The Tower, One St George Wharf at about 08:00 GMT. Sixty firefighters are at the scene near Wandsworth Road in South Lambeth. Doctors said one of the dead was in the helicopter and the other on the ground. Burning wreckage lay in the road but the fire is now under control. A man was rescued from a burning car by firefighters. Four people, one of them critically ill, were taken to hospital. Five others were treated at the scene. The incident caused gridlock with all approaches to the Vauxhall Cross one way system closed at the height of the rush hour and Vauxhall Tube station and railway station closed. The fire brigade was also at St George’s Wharf to secure the damaged crane. London Fire Brigade station manager Bruce Grain said crews arrived at the scene in four minutes. He said the helicopter crashed into Wandsworth Road hitting various vehicles and bursting into flames and there were also fires in nearby buildings. He said the fire was under control within 25 minutes but crews would probably be at the scene for the rest of the day damping down. A lifeboat searched the Thames after a request from London Heliport at Battersea which had lost contact with one of its aircraft, an RNLI spokesman said, but the search was later called off. Video footage shot on a mobile phone showed an entire road blocked by burning wreckage and aviation fuel. The side of a building on one side of the street was also damaged by the flames. Passers-by stood watching as the wreckage burned. A motorcycle was also lying on its side in the road where it was abandoned.